✅BBQ LED Light with Magnetic Base : Premium Quality LED Light with Strong Magnetic base allowing it to be easily secured to the top front or side of any Grill. The 360 degree flexible neck allows for effortless direction of the light beam to any part of the grill you choose. ✅BBQ Thermometer : Instant read water resistant thermometer with backlight. Clear and exact read within seconds for the grilling perfectionist. Do not settle for less - this is the best quality thermometer on the market. ✅Durable and 100% Water Resistant : Our products are Durable - FDA compliant - and 100% Waterproof making them long lasting and easy to clean . Our products or made only from the best parts to ensure the best grilling experience every time. ✅Perfect GIFT SET : Our products are the perfect gift for any GRILLING ENTHUSIAST. Grilling is our passion and we want to share that with the world. ✅100% Money Back Guarantee : If you are not satisfied for any reason, we guarantee a 100% money back return policy. We are very confident in our quality and service and are sure you will be too! 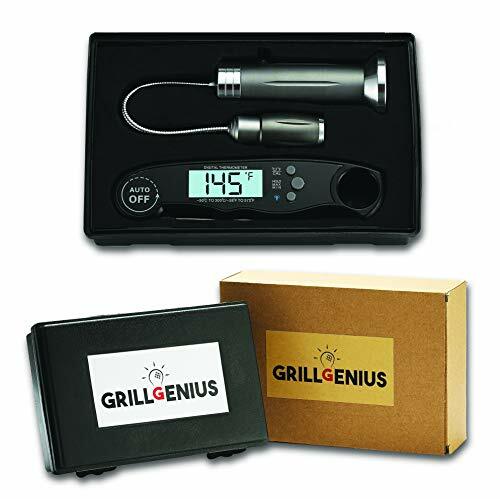 If you have any questions about this product by Grill Genius, contact us by completing and submitting the form below. If you are looking for a specif part number, please include it with your message.